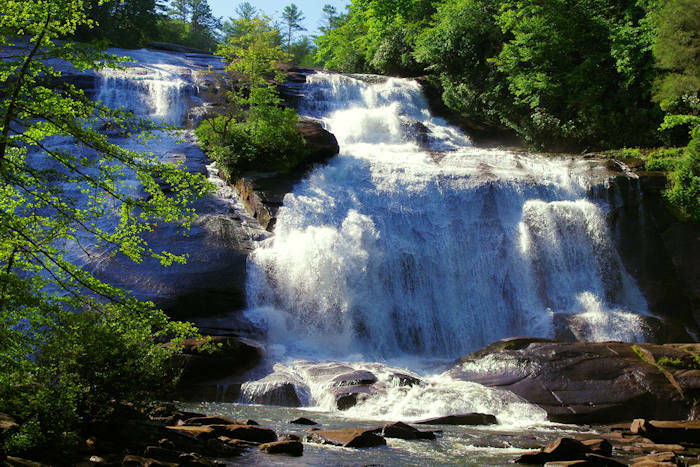 The 500,000+ acres of Pisgah National Forest surrounding Asheville feature some of the most beautiful and rugged mountain scenery, and the best recreational opportunities in eastern North America. 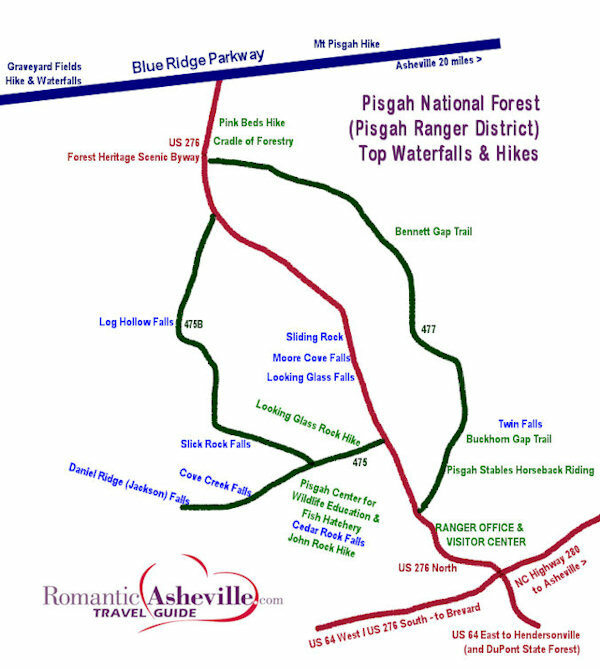 One of the four districts, "Pisgah Ranger District," is a favorite area of ours for hiking and waterfalls, especially along the Forest Heritage Scenic Byway! It's an easy drive from Asheville, and it's near the town of Brevard (with restaurants, gas, supplies). This area is along a scenic loop drive from Asheville: take I-240 West / I-26 East. Continue on I-26 East to Exit 40 for Highway 280 (and the Asheville Airport). Take a right onto Highway 280 West and go 16 miles toward Brevard. Turn right onto US Highway 276 North (Forest Heritage Scenic Byway) to enter the Pisgah National Forest (scenic part begins!). Drive about 16 miles up the ridge to the Blue Ridge Parkway and go north 20 miles back to Asheville. Stop at the Ranger Office & Visitor Information Center at 1001 Pisgah Highway, Pisgah Forest, for maps, info, exhibits and more. Turn left on Forest Service Road 475 to the Pisgah Center for Wildlife Education. The trailhead to Looking Glass Rock is about 4/10 mile down this road. Continue to the Pisgah Center for exhibits and the fish hatchery. Hike from the parking lot to John Rock and Cedar Rock Falls. 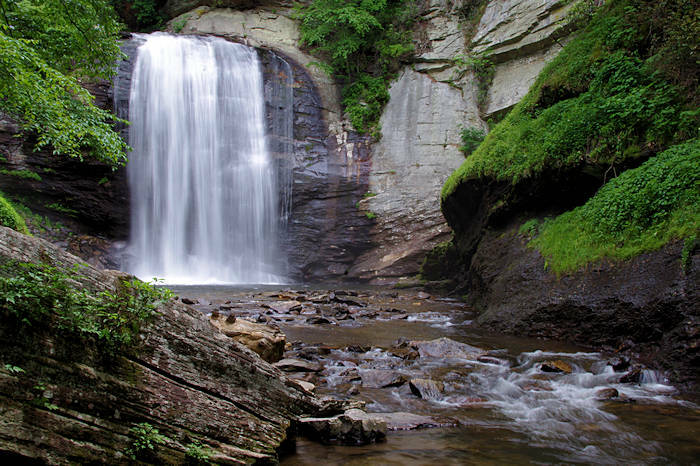 Continue down 475 to waterfall hikes to Cove Creek Falls or Daniel Ridge Falls. There are many waterfalls in this area, so you could hike to several in the same day. 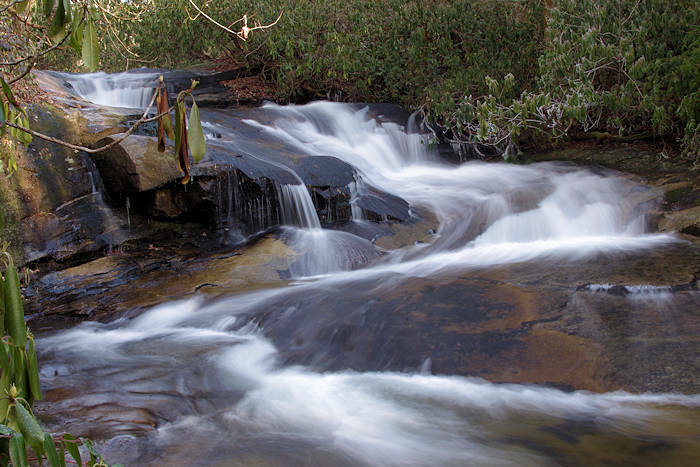 Head back toward US 276/Forest Heritage Scenic Byway, pass the Pisgah Center for Wildlife and turn left on Forest Service Road 475B (one lane, unpaved) to Slick Rock Falls and Log Hollow Falls. If you want to continue to Log Hollow Falls, continue on 475B to US 276. Turn right to see Sliding Rock, Moore Cove Falls and Looking Glass Falls. Turn left for Cradle of Forestry, Pink Beds hike and the Blue Ridge Parkway. Nearby on the Parkway are Skinny Dip Falls and Graveyard Fields. 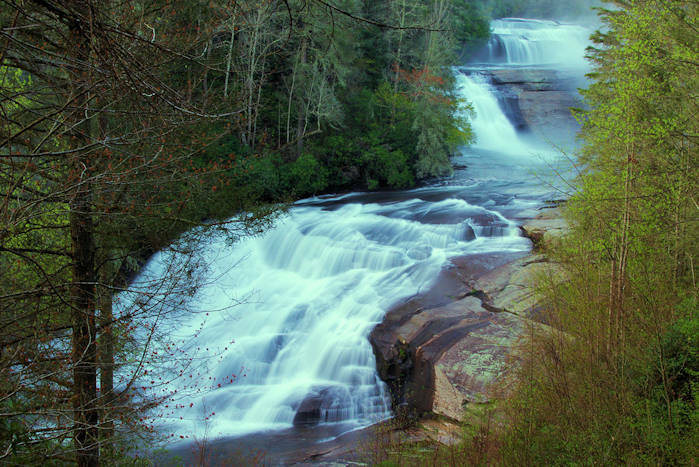 Find six waterfalls in Pisgah National Forest near Brevard, with short, guided hikes "off the beaten path" with the Pisgah Field School, and end with a wine tasting. Mostly Thursdays & Fridays, May-October. Small groups, book in advance. $75/person.